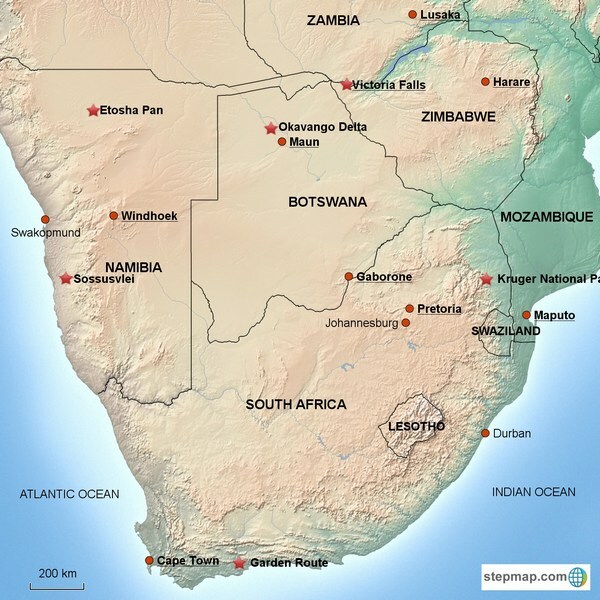 Southern Africa is the large area in the Southern tip of Africa, encompassing all countries South of Angola, Congo and Tanzania. Most intercontinental flights arrive in Johannesburg, with some European airlines also flying directly into Cape Town. The different destinations in Southern Africa can be combined beautifully, thanks to the very good route network of the regional airlines. For example you can fly from Johannesburg to the Victoria Falls, from here to the Okavango Delta in Botswana, and then on to Windhoek in Namibia, from where you will find direct flights into Cape Town. The terrain of Southern Africa is varied, ranging from forest and grasslands to deserts. The region has both low-lying coastal areas, and mountains, most importantly the Drakensberg mountain range, which can be covered in snow during the winter months June to August. One of the most popular holiday activities in Southern Africa is wildlife safaris in search of spotting the Big Five (lion, elephant, buffalo, leopard, rhino). There are game reserves within South Africa, Botswana, Zambia, Namibia and Zimbabwe. Self drive safaris are possible within the many national parks, the private game reserves offer guided safaris in open game viewing vehicles. Accommodation ranges from basic state owned camps to ultra luxurious safari retreats. 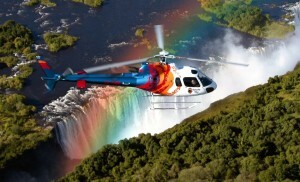 Southern Africa is an adventure haven. The region has some of the highest bungee jumping spots in the world; fantastic hiking and biking trails, great rivers for white-water river rafting and canoeing and excellent surf for surfing and kite-boarding. The Victoria Falls bordering Zambia and Zimbabwe are not only one of the seven wonders of the world, but also a fabulous destinations for all kinds of adrenalin activities, i.e. white water rafting, high wire, bungee jumping, etc. You will also find magnificent beaches stretching all the way from Cape Town around the coast up to Durban, which is a surfing mecca, up to Maputaland, where the beaches seem to be endless – and are always deserted. Further north Mozambique – known for its excellent diving and warm, clear waters – takes over, with the most romantic beach properties on the islands of the Bazaruto and Qurimba Archipelagos. For desert aficionados Namibia is an absolute “must-visit”. The dunes in the Sossusvlei are spectacular, and driving the endless roads through the Kalahari and Namib Deserts gives one the feeling of being alone in the world.